It seems anymore that all I am doing is destination races. I haven't done a race in my town in over two years and 2016 is shaping up to be the same way. Destination races are my preference being I can turn a half or full marathon into a vacation. Over the years, I have ran through some pretty cool places, such as New Orleans, Washington DC, New York City and even Dublin Ireland! With destination races comes the stress of what to pack. I have done posts in the past on packing for rainy weather, packing for an international race and packing for a multi race weekend (like Disney's Dopey Challenge). Over the next two weeks I face a new type of travel struggle - keeping my nutrition in check while traveling. I started this week off with a work trip to Atlanta, fly home on Thursday night, leave Friday morning for Disney because my best friend and I are running the Walt Disney World Half Marathon on Saturday morning, then leave immediately after crossing the finish line for a 7 night cruise on board the Carnival Valor. So if you're following - 3 nights in Atlanta, followed by 1 night in Orlando, a half marathon, then 7 nights on a Cruise. My favorite thing to do while traveling is checking out new hip restaurants. I don't worry about my diet and tend to over indulge. What can I say, this girl has a huge weakness for finding the cheeseburger in town. Given I will be in Atlanta this week then head straight to Marathon weekend, this cannot be the case. While I will be going to dinners with teammates and friends, I will have to make sure I keep the rest of my nutrition on point. I will be sure to bring my protein powder and nutrition supplements with me this time, especially since I have a 6 mile taper run scheduled while I am in Atlanta. 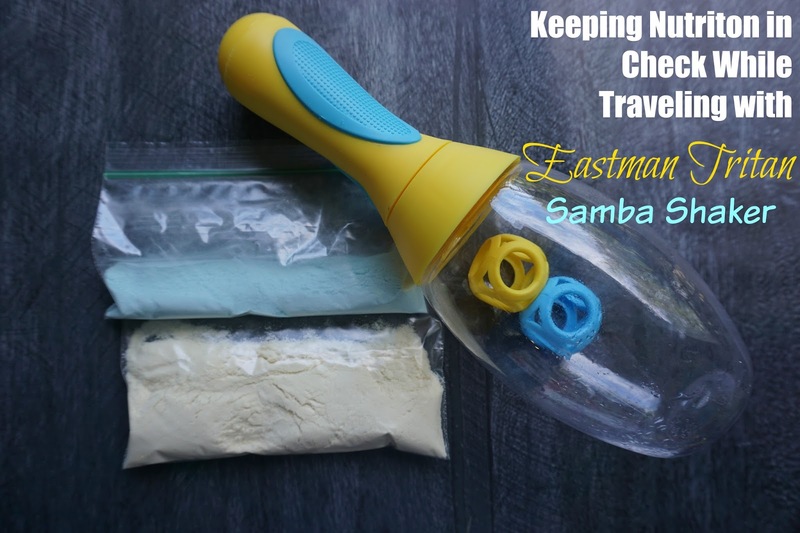 I was given a Samba Shaker by Eastman Tritan for review purposes and quickly learned it is the perfect shaker for travelers. It's made of PA-Free Tritan™, a sturdy plastic that looks like glass which is used in many of the top brands you are familiar with. My favorite feature of the Samba Shaker is that it has a hidden compartment to store your powder mix. This is a travelers dream. I brought both my protein shakes and my pre-workout supplements with me. While I have never had a problem walking through TSA with them, I do always label what everything is. I pre-measure out my mix into snack sized ziplock bags so I don't have to worry about measuring anything out. The mixing balls were engineered so your drink is mixed perfectly without a milky substance. Plus it is very easy to clean and is dishwasher safe since you are able to remove all of the parts. I do think the Samba Shaker got it's name from it's fun shape - I felt like I should be in a conga line while making my protein shake. That's not to say I didn't have a cheeseburger while in Atlanta.....I couldn't resist the opportunity to try the famous Holeman and Finch burger, named one of the top burgers in the US. Sign up for the TCS NYC Marathon today!